This is a BIG edition of The Little Things Thursday. Since I missed last week, I'm doubling up on this week. Enjoy getting a peek into our life! It's a little blurry, but she wouldn't hold still long enough to take the photo. Ellie loves any shoes that she can find. This particular day, she found her Daddy's shoes. 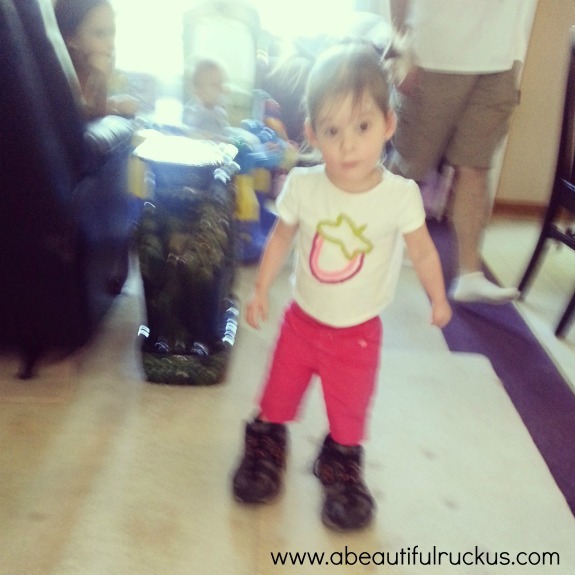 She's actually become pretty good at walking around in shoes that are far too big for her! 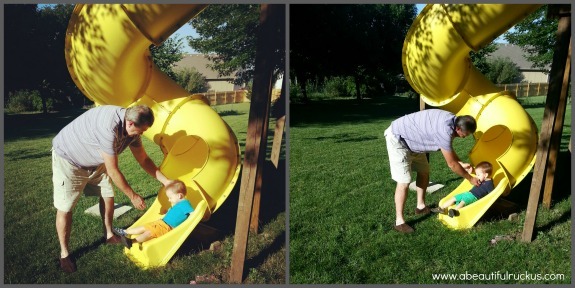 Okay, first look at how Caleb (left) and Elijah (right) look as they come down the slide. 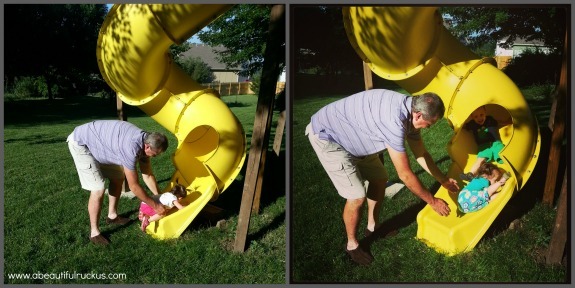 Now look at how Ellie (left) and Abby (right) look as they come down the slide. LOL! There were a few days when I would walk past our coat closet and see something strange hanging on the door knob. A lunchbox? I have no idea why the kids hung it there. I would take it down, put it back in the play area, and it would suddenly reappear back on the door knob. They never hung anything else there. Always the same lunch box. Then one day it stopped, and I still don't know who kept hanging it up. What is going on inside their heads?! This is pretty much what my house looks like right now. It's a month until our mothers of multiples consignment sale, and I'm prepping for it like crazy! Not only do I have to have all of our outgrown clothes priced, but I have to go through bigger sizes and figure out what we need for the next six months. 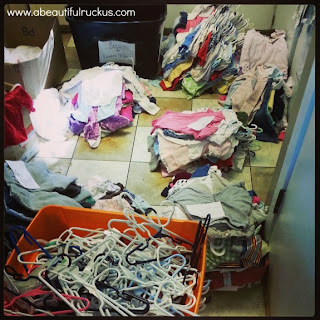 The month before a consignment sale always gets a bit stressful for me since there is so much that needs to be sorted, organized, priced, and planned before hand. It's hours and hours of work, but we save a lot of money doing it this way. 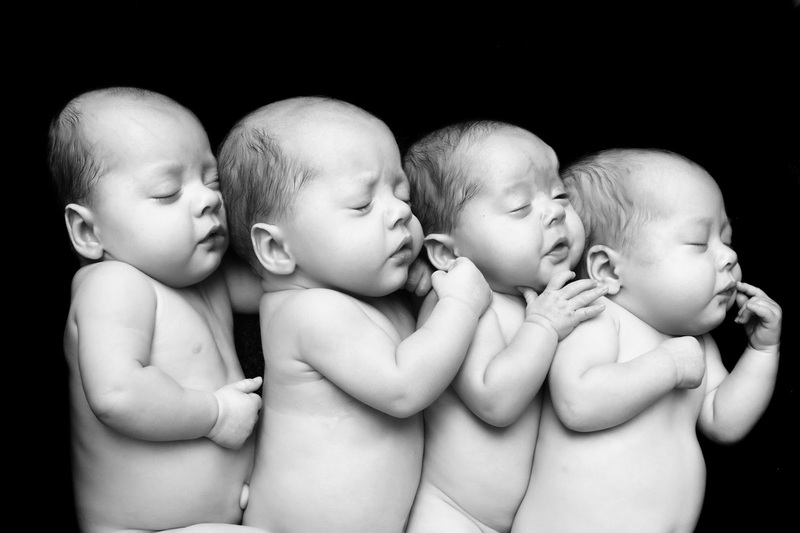 Remember this adorable photo by Abundant Moments Photography? Aw, it's one of our favorites! She sent me a message this week that she submitted it in a photo contest! 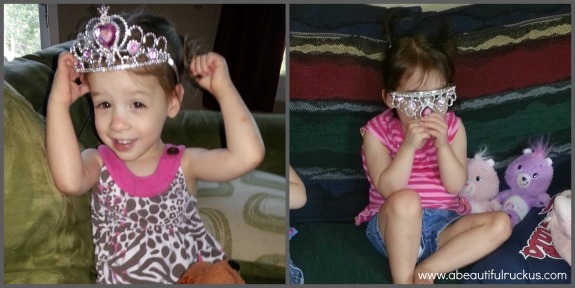 Would you help us support her by giving it a quick vote? You can only vote once, so this will be the only time I ask, but we would love for her to win since this was not an easy photo to take. Did I mention that right before she was able to take this, Elijah lifted a leg and peed on her? Thanks for voting HERE! 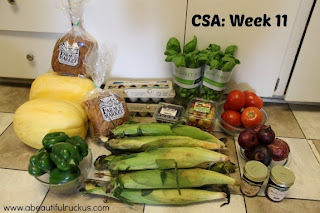 Two weeks worth of CSA bags in this week's Little Thing Thursday since I missed the post last week. 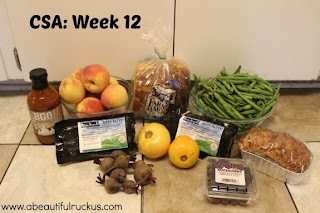 Week 11: Sean's coworker gave us her bag since she was out of town! Two melons, six bell peppers, two dozen eggs, two loaves of Farm to Market bread, twelve ears of corn, two packages of blackberries, two pints of tiny tomatoes, six big tomatoes, two live basil plants, six red onions, two jars of preserves. There was so much that we are still eating on it. Delicious! Week 12: 1 bottle of Boys Grow Barbecue Sauce, eight peaches, two pounds of organic ground beef, seven beets, one loaf of sourdough Farm to Market bread, two pounds of green beans, two tomatoes, one package of blackberries, one loaf of blueberry cinnamon bread. I really love this little things thursdays. I have twins but you have four! They are adorable. If you haven't, you should do a blog on consignment. I am interested in learning how to make a profit on selling the girls clothes. 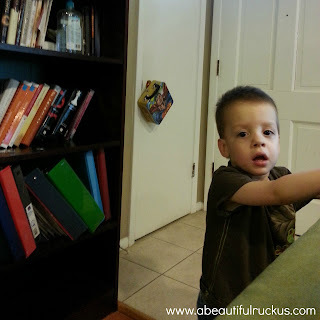 Visit us at preemietwinsandme.blogspot.com. I love our local Moms of Multiple consignment sale, too! In fact, this year I'm on the team to help organize the event. I used to LOVE wearing my dad's shoes around the house - there are so many pictures of me doing that over the years! They seemed so MASSIVE then!! Thanks for the memory! Today I am having bad cramps and hubby loaded me up in bed with meds, heating pad, cheese and crackers, prayer, the "permission" to stay in bed all day and rest... I feel so loved. It's not a "little" thing, but it's what made me day brighter. Your consignment picture made me cringe since that is what my house looked like last month, now all the items are at the sale this weekend (I live in Va). All the extra prep is worth it when I get the check! Good luck!! Look at those beautiful smiling faces and all those fresh veggies!!! What abundant blessings! 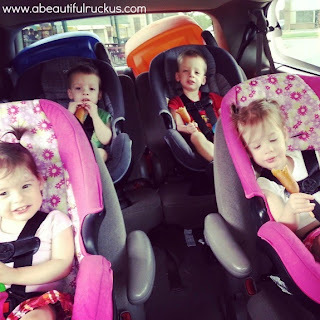 Your kids are growing- looks like it's time to raise the straps up to the next notch on their carseats! (You always want the harness coming from above the shoulders when they are facing forward.) I voted for your picture. Hope you guys win!